BetAmerica sportsbook is one of the few operators in the US that is fully focused on the American market. BetAmerica was established in 2008, so they are relatively new in the industry. Despite that, they have a reputation of a reliable betting operator with a solid offer, exceptional in horse and greyhound racing. 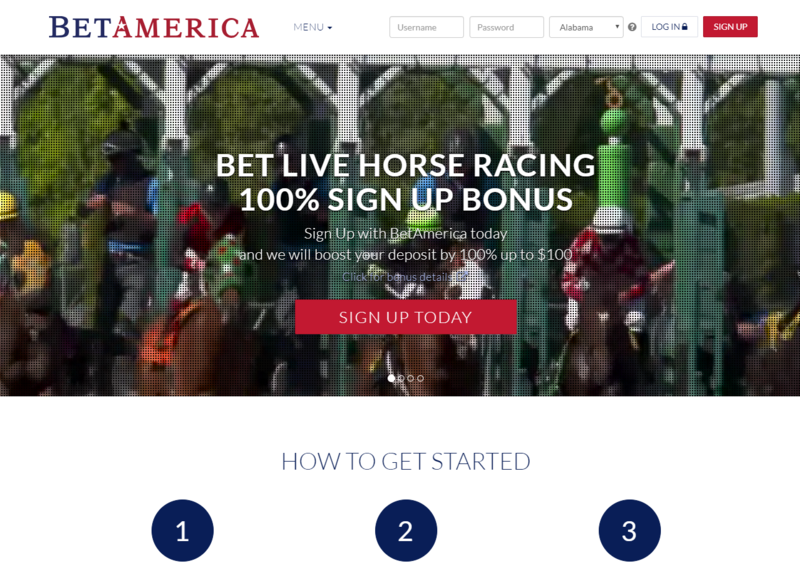 In this review, we will tell you everything you need to know about BetAmerica so you can decide if you want to open an account there. BetAmerica offers several deposit methods you won’t find anywhere else. Apart from credit cards, instant bank transfers and wire transfers, you can deposit your money using checks, MoneyPak, PayLucky and PayNearMe. Every option except for checks and MoneyPak are instant, but we recommend Visa and Master Card as the most convenient way of deposit. Although BetAmerica sportsbook offers a wide variety of deposit methods, you can withdraw you winnings only via checks and direct bank transfer. The direct bank transfer is the easiest and safest way for withdrawing money from BetAmerica. BetAmerica has a modern, good-looking interface, which is not strange considering they are a relatively new company. The markets are located on the left hand side of the screen, while the bet slip will appear on the right hand side of the screen after you make a selection. BetAmerica uses color patterns of the USA flag, which is appealing to the US patriots. Mobile App design is similar, it is completely functional and you can bet, manage your account and even watch races live from your mobile device. BetAmerica sportsbook odds and bet limits are within the standards of the industry. However, since they are strongly orientated towards horse and greyhound racing, you will get numerous special offers in that markets, which will enhance the odds and make BetAmerica your best partner for betting on racing. BetAmerica offers one of the best welcome bonuses for a US-based bookmaker. They offer a 100% deposit bonus up to $100! If you deposit $50, you’ll get a $50 bonus. If you deposit $100 or more, you will get a maximum of $100 bonus. BetAmerica also offers numerous bonuses to their old customers. If you have an existing account opened at BetAmerica, you will get access to their bonuses that are changing on a monthly basis. Usually, they offer a percentage of cash back on fantasy sports bets and a percentage bonus on horse racing accumulators. BetAmerica sportsbook is a great option if you are into horse and greyhound racing and fantasy sports. They have an excellent welcome bonus that will help you earn extra cash on them as well. Interface is modern, mobile website functional and fast, but if you seek betting on traditional sports and markets, you should look elsewhere. BetAmerica is specialized for racing.